Normally the Ursids meteor shower isn’t that spectacular, and when it peaks this year around the 22nd of December, a bad moon will make viewing it difficult in Europe and Asia, and it will be daytime in North America. So why is Peter Jenniskens, a meteor astronomer at the Carl Sagan Center and SETI Institute, travelling all the way to the North Pole to view it this year? We are preparing to visit the North Pole on December 22, to see an unusual meteor shower called the Ursids. This meteor shower radiates from the constellation known as the Little Dipper: Ursa Minor. This minor shower is quite unremarkable in most years, but this year the parent comet 8P/Tuttle is approaching, and it has a strong Perseid-level shower in store for us. We think. We predict a peak time around 20 – 22.2 Universal Time and a width of 5 to 8.5 hours at half the peak rate. The Ursid outburst is too rare an opportunity to miss, though, because the comet returns only every 13.6 years. This time around, the comet comes closer to us than ever before, at least since it was discovered in 1790, passing at only 0.25 AU on January 5…. The Ursid outbursts are somewhat of a mystery. They have been heard, more than seen, in the years around past returns of the comet, by people listening for distant radio stations. Each time a meteor appeared in the cold winter sky, it would create a trail of ions, which reflected radio waves to the observer. They would hear a brief "ping". While counting those pings, it was clear to those listeners that something unusual was happening on December 22 in some years. In collaboration with Esko Lyytinen of Helsinki, Finland, and Jeremie Vaubaillon of Caltech, I investigated these reports, and we discovered that the dust may have been ejected by comet Tuttle around AD 300 to 900, or perhaps earlier. Results will be published in the upcoming December issue of the Journal of the International Meteor Organization. It takes a long time for the dust to move from an orbit similar to that of the comet into an orbit that can hit Earth. Close encounters of Jupiter near the ascending node of the comet orbit seem to play an important role, especially when they occur shortly after the dust has been ejected and is still concentrated in space. The dust itself is most affected when its motion around the sun "rings," or resonates, with that of Jupiter. The upcoming outburst is a great opportunity to test this model. When the Earth travels through the stream of dust, we may hope to see the dominance of some particular returns of the comet in the past, when all the dynamics worked in our favor. This could cause a particular peak time and rate profile of the shower. To investigate this, we are hoping for an opportunity to observe the outburst from a Gulfstream V aircraft in a mission similar to our campaign to study the September 1 Aurigids. If approved, the Ursid flight will be a long 16-hour mission, involving one aircraft, departing from NASA Ames Research Center in the early morning of December 22nd. 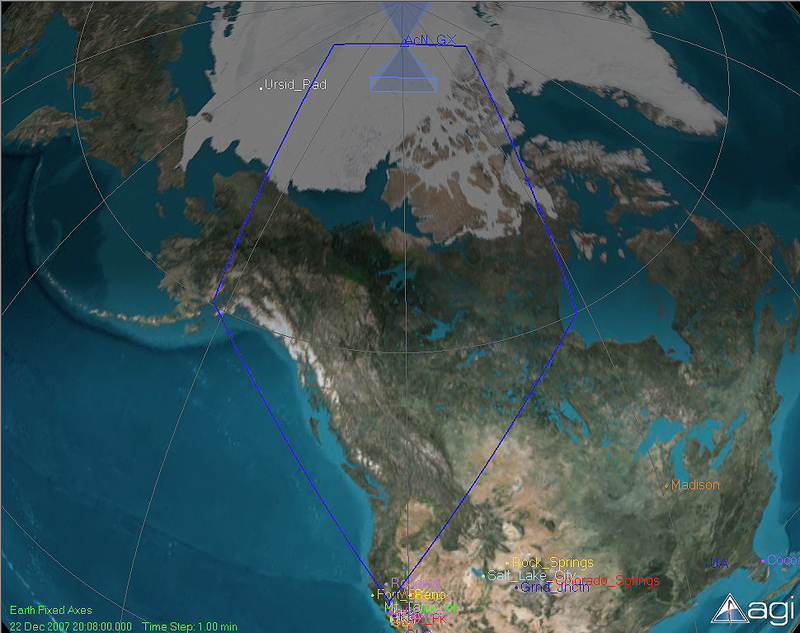 The plane will fly north-west towards Alaska, land in Anchorage for a refuel stop, and then continue on to follow the Earth’s shadow, fly over the Arctic and turn towards Canada to return at Ames just after sunset. We don’t need to fly all the way to the North Pole, just far enough north to stay in darkness all the time. The aircraft will follow the Earth’s rotation, making the meteors fall from a radiant high in the sky throughout the mission. The moon will stay low on the horizon on one side of the plane. 16 hours? That’s a long flight in a cold place. 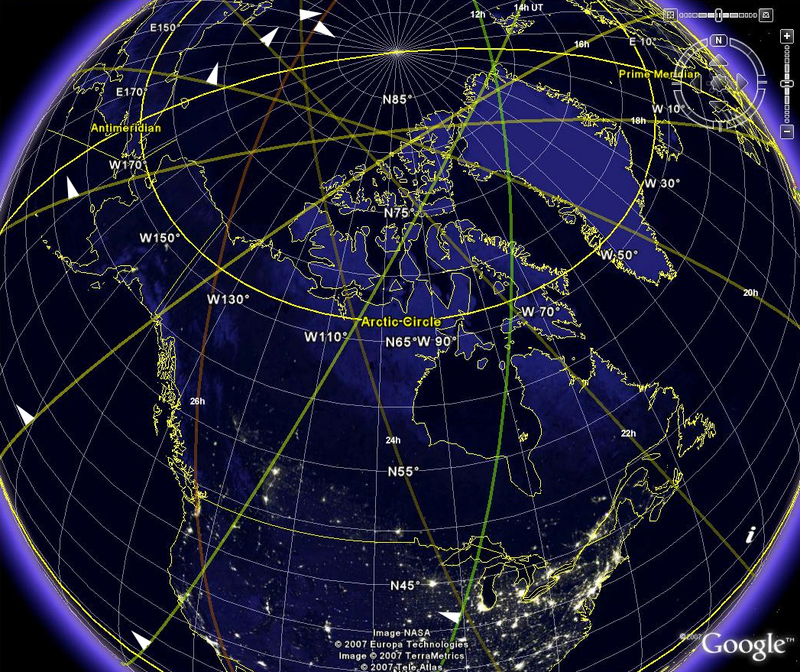 The flight path of Jenniskens’ Gulfstream V can be found here and here; the Federation des Astronomes Amateurs du Quebec also has some good finder charts here. Finally, for spotting Comet 8P/Tuttle, this finder chart is helpful. Happy comet and meteor gazing! This entry was posted on Thursday, December 13th, 2007 at 8:08 am	and is filed under Space Tourism. You can follow any responses to this entry through the RSS 2.0 feed. You can leave a response, or trackback from your own site.